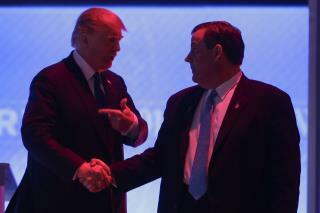 (Newser) – A big get for Donald Trump: Chris Christie endorsed him Friday in a surprise announcement, CNN reports. "The best person to beat Hillary Clinton on that stage last night is undoubtedly Donald Trump," Christie said during a press conference with Trump in Texas. Trump's response: "Generally speaking I'm not big on endorsements," but "this was an endorsement that really meant a lot." Both men noted their longstanding friendship, with Trump saying Christie had been a friend for "many years" and Christie saying their friendship goes back a decade, the New York Times reports. Trump is under investigation for his "Trump University", a scam which cost entrepreneurial, lower middle class people, the very people he appeals to, much of their life savings, for nothing. Trump is involved in other scam colleges which charge much but are unaccredited and graduate people with sham degrees. A few years ago, he had vets, who were given fruit stands to help then get back on their feet, driven away from outside his Trump Plaza because he said that they looked bad in front of his hotel. Proving that he doesn't give a damn about vets, or about anyone else for that matter. Christie is an innocuous den mother compared to much of the riffraff endorsing Trump these days. David Duke? Maybe Prussian Blue ought to come out of retirement to sing at Trump's rallies.